In contrast to the striking landscape that glides past, each twin or double cabin offers a soothing blend of signature Peruvian accents and in-built oxygen for additional comfort at high altitudes. 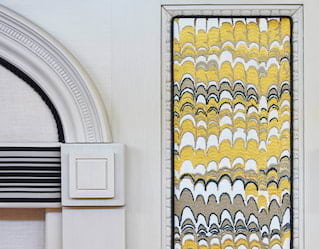 Hand-woven fabrics and soft, Alpaca-style textures invite a leisurely rest. An en suite bathroom and shower permit luxurious bathing––even at 4,000ft. 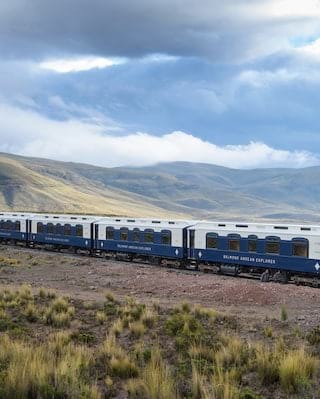 Snaking its way through the Andes, there’s no mistaking this midnight blue voyager. A hand-painted ivory exterior hints at the craftsmanship inside: fabulous timber finishes, linen-covered walls, leather seating and bathrooms fashioned from local stone. 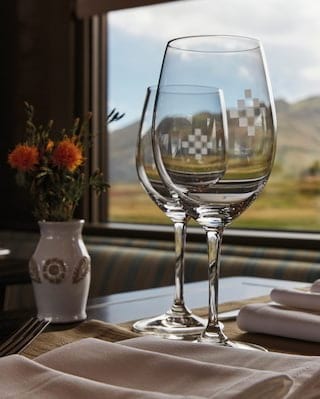 A fitting echo to the soothing landscape, Belmond Andean Explorer is the ultimate base from which to uncover Peru. These cozy cabins offer the most authentic sleeper train experience. After a day’s activities, freshen up in a private en suite. Each 5.5m2 cabin features a long banquette that transforms into comfortable upper and lower single berths. Unwind in these spacious cabins. Admire passing scenery, or freshen up in your en suite bathroom. During the day, these 7.4m2 cabins are configured with a long banquette and comfy seats. Stewards convert this into two ground-level single beds come nightfall. These cabins feature a plush double bed and cozy seating area with two chairs and a table––perfect for journaling your highlights. Fitted with a compact wardrobe, en suite with shower, washbasin and WC, this 13.1m2 space is an elegant onboard retreat. Be welcomed into your cabin with a beautiful floral bouquet; a fine way to scent any voyage. Enter your cabin to find a chilled bottle of champagne. What better way to toast your adventures? 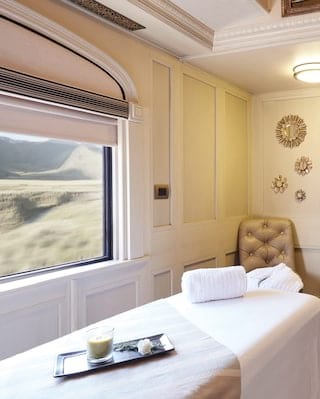 Indulge body and mind in stylish surrounds as you meander through the Andes.